While I was creating the charts for yesterday’s June Netherlands electric car sales article, a realization of sorts hit me: What if all automakers tried to sell electric cars like Tesla does? In simpler terms: If the auto industry shifts to electric cars, conventional automakers are screwed. But hey, let’s dream for a moment. Dreaming has been the EV and solar theme of the past week anyway. What If Tesla Had Teammates/Challengers? You can choose a label for what other automakers would be if they tried to sell electric cars as hard as Tesla does. Many media outlets call them “challengers,” “fighters,” “killers,” etc. I’m more inclined to call them “teammates” since they’d be working together to electrify transport, help stop global warming, and cut air pollution. In the purest sense, automakers would have to be 100% electric automakers in order to be “trying as hard as” Tesla. The story would be over at that point, so I don’t want to start there with this thought exercise. Rather, let’s first play with some numbers and then list (you can add to the list in the comments) a series of things that automakers could/would do if they didn’t share Sergio Marchionne’s opinion and actually wanted to sell as many electric cars as possible. Tesla has one “mature” model and one “new” model that it’s currently producing. 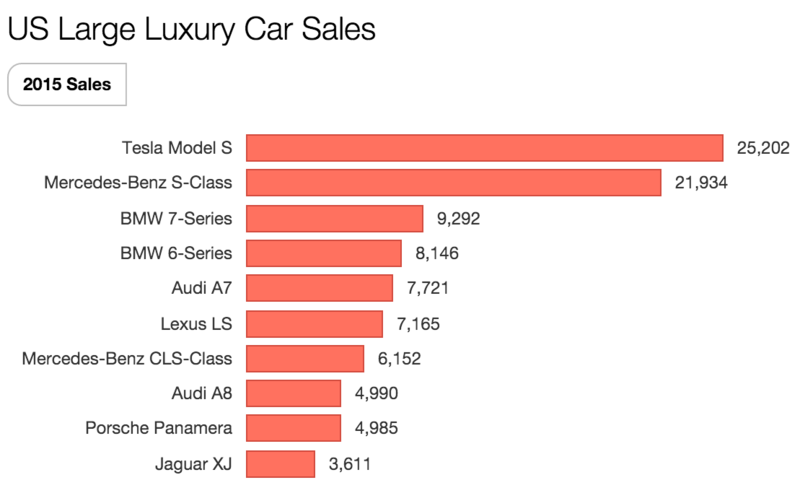 Just considering the “mature” Model S and the US market (for simplicity’s sake), there are a few metrics to take into account. BMW, the automaker which has the highest percentage of its sales coming from plug-in models right now, is also worth taking a quick look at before jumping into some make-believe numbers. In the first half of 2016, the fully electric BMW i3 accounted for 2.7% (1 out of 37) of its passenger car sales, and all of BMW’s plug-in models accounted for 5.9% (1 out of 17) of its passenger car sales. I definitely wouldn’t say these numbers are a sign of a company trying hard to sell EVs — just a company not trying so hard to avoid EV sales. Considering the above points, what would the story be if even half of conventional automaker models were electric models, and they were available in as many locations as their gas cousins, and the number of electric cars on a dealership lot was the same as the number of gasoline cars on a dealership lot, and EV advertising actually highlighted key consumer benefits of EVs? That would add up to 1,034,530 electric car sales in one month. That would be ~107 times more electric car sales than we had in the month of June. Those numbers might seem ridiculous. Well, they are. But if automakers stopped trying to delay EV adoption and actually tried to stimulated more of it, the story would be radically different than it is today. Below are some of the ways that automakers could increase EV sales dozens of times over. As automakers run up against stronger and stronger fuel economy and emissions requirements, they are creating more and more plug-in hybrid electric models. These can be portrayed as “bridge” models to full electrification, but they certainly leave a lot to be desired, and Tesla stayed away from them for some obvious reasons. I think it was actually from typing in all of the low-range, small-battery, half-effort plug-in hybrids from certain automakers that I was triggered to write this article. If the automakers were at least creating Volt-like drivetrains that offered pure electric driving and enough electric range for ~90% of trips, that would be one thing, but they are creating plug-in hybrids with 6–15 miles of electric range…. The “instant torque” fun and convenience is greatly limited by a smaller battery, not making it so obvious to consumers why they should pay extra for a plug and battery. Speaking of cost-competitiveness, the problem with PHEVs is that they are essentially two cars in one. Incorporating an electric and gasoline drivetrain increases the cost of the car, which scares away many a buyer who decides she/he would rather save a few thousand dollars and get an Audi A3 than an Audi A3 e-tron, as just one example. Again, with a small battery, the slightly better acceleration, convenience of home charging, and fuel savings don’t go far in convincing the average buyer that a plug and a battery are worth a few thousand dollars. I’ve criticized quite a few electric car commercials over the years, and when I first drove some electric cars (not even Teslas), I was inspired to write an article titled, “Electric Cars Are Totally Bloody Awesome (Missed Messaging).” Unfortunately, I haven’t seen much (any?) sign of progress since that 2013 article. EV ads tend to focus either on the “hippie green” angle (I’m all about hippie green, but that’s a weak focus if you really want to move EVs off lots) or some generic message that doesn’t really even target anyone. As I say in presentation after presentation after presentation after presentation, and article after article, there are two awesome things about electric cars that both Al Gore and James Inhofe can appreciate: instant torque (which is fun and also cuts the stress of driving) and convenient home charging (you get home, you spend 2–3 seconds plugging in … or not, and then you do whatever the heck you want — you don’t have to regularly find a gas station, get off the highway in the midst of a trip, get out of the car and pump some smelly gas, pay for the gas, get back in the car, get back on the highway, and finally resume your trip). If automakers just spent a bit more time and money trying to convey these benefits to consumers, electric cars could be flying off of lots. Well, maybe…. It’s “fun” when you decide you want to test drive an electric car and you go to a dealership to do so only to find out that they don’t have it — not today, not tomorrow, and probably never. In Florida, one of the largest car markets in the world, the electric cars available to test drive and buy include Teslas (of course), BMWs, the Nissan LEAF, the Chevy Volt, and the Porsche Panamera S E-Hybrid. Approximately a dozen other electric cars supposedly “on the market” aren’t available in Florida, or Georgia, or South Carolina, or North Carolina, etc. — they’re just available in a few states. It’s hard to sell EVs when you don’t actually sell them. The electric car market, at this stage, doesn’t just need automakers to design and promote electric car models. It also needs an incomprehensible increase in battery production and much better charging networks. Automakers can and should have a hand in bringing these things to life, but most of them are basically sitting on their hands and waiting for others to create the future for them. Set up electric-only subsidiaries that are inherently incentivized to propel the electric car market forward, rather than inherently disincentivized from doing so. I simply don’t see another way for automakers to insulate their EV efforts enough from the gasoline-car collapse and everyone in the business who wants or will want to slow the collapse down. I know this isn’t a straightforward task, since automakers are forced to go through dealerships (and some unsuccessfully tried to dump dealerships in the past), but electric-only dealerships, subsidiaries like Tesla that have their own stores, or some other creative solution could surely be implemented to solve the dealership dilemma. Current dealerships are too incentivized by service revenue and too uninterested in learning about EVs — providing an extra obstacle to EV adoption, a large one. Assuming you take the advice above, you will have demand, but you obviously need to have EVs in the car classes that people desire. So, the last piece of gigantic (and undesired) advice is to build out your portfolio of electric car models ASAP — one compact electric car model does not make you a leader for long. I know — Sergio has more auto industry friends that I have, and I’m just an outsider with crazy dreams. But the future waits for no one, and people who try to slow the future down don’t often end up keeping up with the competition.